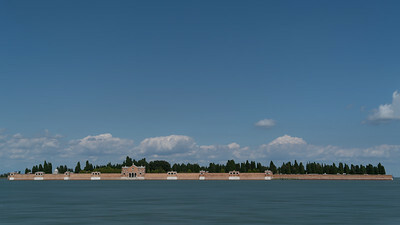 The view of a little cemetery island in the city of Venice. I haven’t yet explored it, but probably will the next time. My first impression was of a military fort, and I suppose with San Michele in the name that’s not too far off. Nevertheless, it looks to me like an entirely different space away from the crowds. My intention for this image is minimalism. It could easily have ended up as a tourist photo but, I saw this idea in my head when taking it. When I’m walking around a crowded area, I have to think hard about how I might like an image to look, especially if I want to go minimal. Coming up with ideas is the first part of the creative process. Crowded spaces can also be fun to photograph, especially if there is a story to tell. For instance, a crowd of people on a bridge, or a city scene. But sometimes I find myself moving away from the crowds, if not physically then mentally. By putting my mind in a quiet place, I see things in a slightly different light, or so I like to think. 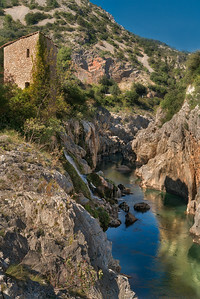 This is the Hérault river in Southern France. 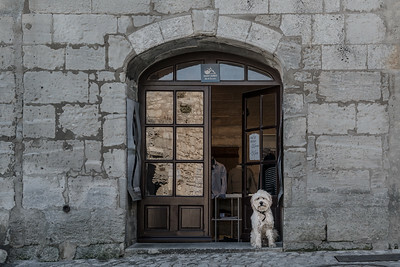 We stopped here for a brief rest on our way back from a visit to the mountain village of Saint-Guilhem-le-Desert. There are a lot of rivers running off the mountains here and many have ancient bridges or structures alongside. Just off to the left are a set of caves that, had we not been so tired, we could have explored; something to add to the next trip I suppose. If stopped at all the good spots for pictures I would never get anywhere. This is especially true in a new place, but even at home, I’m in the habit of scanning. Unconstrained, I could go to the store for milk and come back days later, still thirsty but with a lot of pictures. That’s why I don’t bring my camera when grocery shopping. Even though sometimes I think I should. 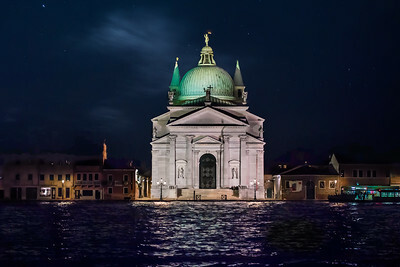 This is an image I took along the Grand Canal in front of Basilica di Santa Maria della Salute. I was taking pictures like a madman at the time but the conditions for photography were not good. Normally, to take pictures at night you need a tripod and a stationary subject. In this case, I was in a moving gondola and my subject was moving also. To get this I used an aperture of f1.8 and an ISO of 8000. That's extreme but with a few adjustments in post-production, it's a winner. So much for the old rules. Because I don't know what all the rules are I do things that another photographer might not. I make a lot of mistakes, but I also get some good shots under difficult situations. The tech is so good now you may as well push it and see what happens. One day we'll have sensors in our eyes and cameras will be obsolete. But until then, it's fun to keep breaking the rules and trying new things. When in big cities I'm usually quite happy with rain. It creates scenes and situations that are interesting to observe. First of all, people are carrying umbrellas which by itself creates a certain aesthetic. 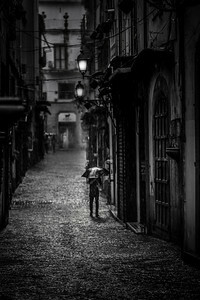 Then there are the motions people go through to keep out of the rain, like running from one source of cover to another. However, in places where it rains all the time, you will also notice how well people ignore it. Amsterdam is one of those cities where people are always outside, rain or shine. So it's just as interesting to see what they don't do as what they do. In this case the couple were taking selfies and the gentleman was texting the pictures on his phone, oblivious to the precipitation. 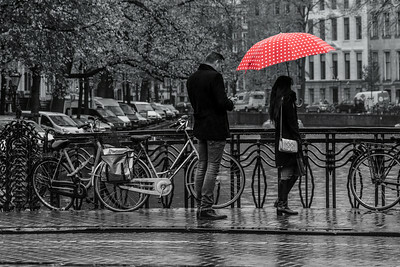 I noticed that in Amsterdam people are always riding bikes regardless of the weather, in some cases holding umbrellas as they go. I haven't quite perfected the art of ignoring the rain. I'm a duck and cover kind of guy. But from a temporary shelter I can stand there, observe and take photos of things around me. The best part of that is stepping into a bistro and waiting it out with a hot chocolate. Then, sufficiently refreshed I head back out for more fun. 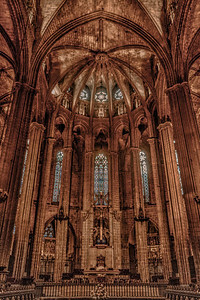 Here are a couple of shots inside the Cathedral of Barcelona. I took these on our first trip when we stayed right across the street. I walked over first thing in the morning, which was apparently a good idea because soon thereafter the crowds began grow. This cathedral is the centerpiece of the city's gothic section and is a huge attraction. These were shot handheld because I didn't bring a tripod. Actually, I didn't think it would be allowed so I didn't even try. But as I recall, someone else did have one. Nevertheless, I shot these with the help of stabilization on the Sony sensor and the images came out fine. I have two very expensive tripods, but I'm finding I use them less and less these days due to the advancements in the digital sensors. After looking around I went back to the hotel for breakfast. Then returned about an hour or so later. By that time the crowds were enormous. I was glad to have made the early visit and take these pictures. And maybe if I ever do that again I'll bring a tri-pod, or maybe not. 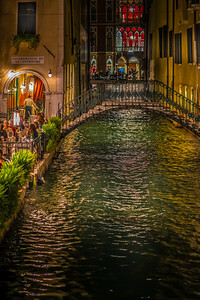 Here is a little section of a restaurant along a canal in Venice. Our timing was fortunate because we were seated right away while others who came later had to wait; Italians are late eaters. We enjoyed an amazing meal seated along the canal on a warm summer evening. For the life of me I can't remember what I ordered but I do remember it tasted very good. As chance would have it we were surrounded by tables of Americans, even though there were people from other countries as well. On one side was a group of college girls and on the other was a couple of producers with their wives. There was a film festival going on and I could hear everything the producers were saying. It was one of those situations where you can't help but hear the conversation, the tables were very close. Somehow the producers started talking to the girls since one of them was trying to break into the business. And on and on and on…. Being an American tourist myself I try to be a little circumspect, I know that a reputation proceeds us. There's nothing wrong with American tourists, but every so often you can sure pick them out. I know I'm a little too quiet, but I prefer to soak up the ambience. That includes the gondolas, lights shining from windows on the canal, amazing Italian food, wine, and occasionally the conversations of my fellow Americans. Here is a shot from atop the Grand Hotel Central in Barcelona. I took this in the morning on my first trip here. 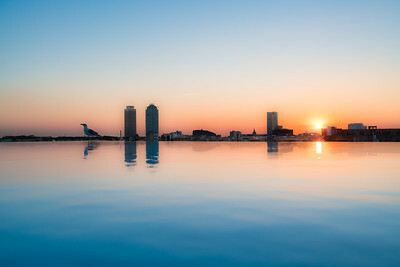 Morning is a better time for these kinds of shots because around sunset the pool will surely be filled with guests sipping martinis or sangria, as the case may be. Looking at this I just realized that the second building from the left is the hotel I stayed at on my second trip, the Hotel Arts. I should have known because there are no other tall buildings in this section of town. Perhaps unknowingly I was seeing reflections into future, or some such thing. I did come up in the evening with my camera, but it just wasn't the same so I'm glad I was here at sunrise. This hotel is in the gothic section and that other one is along the beach, two completely different areas with their own character. About the only thing they have in common are martinis and sangria. 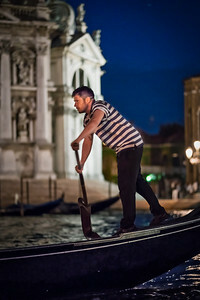 If you go to Venice take a gondola at night. It is an experience that reminds me of a ride at Disney World, only it’s the real thing. The sounds of the oars in the water and the lights streaming from the windows overhead combine in the most exquisite way. 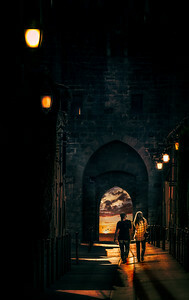 I don’t recall exactly where I was when I shot this but it was probably close to the gothic quarter in Barcelona. I spent a lot of time shooting scenes at night there, just out having a good time. In the middle of summer, that’s what everyone does. This is from St Paul de Vence near Nice France which is an art colony on a mountain overlooking the Mediterranean. It’s an ancient village with narrow streets lined with shops and studios of every type. I snapped this of a random artist as I walked around one day. 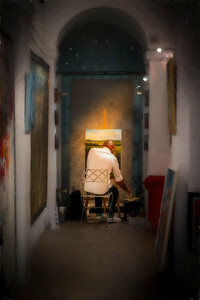 Having spent so much time processing photos, watching an artist at an easel seems a little familiar to me. What I do with photography is different, yet I think I get into a similar mindset as say a painter or sculptor. As I work with photos I create something new, mostly from an idea I have of the scene. Even though it’s a photograph I alter it through post processing to achieve a certain look. So, while it’s very different than using paints, my head is probably in a similar space as other types of artists. That’s the thought that struck me as I watched this artist quietly from behind. The solitary pursuit of his vision seemed very familiar to me; so, I took a picture and started the whole process over again. I was walking through the old section of Kotor and came upon a group of nuns on vacation. At least I think they were on vacation, I didn’t actually speak with them. But they seemed to be having fun nuntheless. I’m not really in the habit of following people around, but I kept running into the same group. 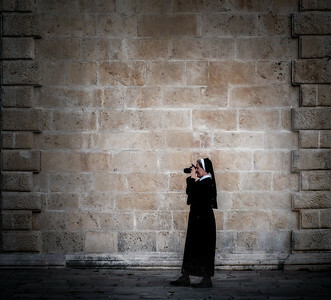 On no prior occasion have I seen nuns with cameras and iPhones, just like the rest of us. I don’t know why I found that odd, perhaps they are allowed to order these items on Amazon. But again, with nuns I am a novice and I could have it all wrong. Anyway, I saw the group of them a couple of times and I took a few pictures of the spectacle. There is a certain ascetic to this scene that I find pleasing. I don’t see a lot of vacationing nuns in Florida. There is nothing much for them to see here except people that lay on the beach. And trust me, we have the mother of all beaches. But, they could raise money by selling French Fries. Anyone could order and they would just put the ingredients in the friar. 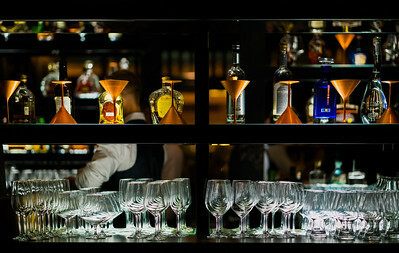 Here is a photo from the bar at the Hotel Arts in Barcelona. I’ll admit I’m not very sophisticated when it comes to swank establishments like this. More often than not I don’t know what to order. But the ambience can be a work of art and something I like to capture, with or without a cocktail. I’m a reluctant photographer. I get a little uncomfortable setting up my camera in places like this. Yet I’m always happy when I do, so the trick is overcoming the hesitation. In this case the hotel is filled with tourists so it’s not unusual that I would have a camera. It was no big deal. Cameras attached to our phones are getting so good that soon we won’t have to choose between quality and conspicuousness. No one notices when we take a photo with an iPhone. Once smart phones can produce this level of quality in low light we will no longer need regular cameras. Maybe. 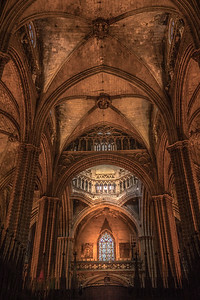 This is from the inside of the Basílica de Santa Maria del Pi in Barcelona. It’s a 14th century church that features elaborate stained-glass windows. I was walking around the gothic quarter and “found” the church in one of the squares. Many of the squares have churches and this is one of the larger ones. I think there are as many churches in Barcelona as Starbucks. I came inside to take some photos and get a break from the summer heat. It might have been a little cooler inside but not by much. 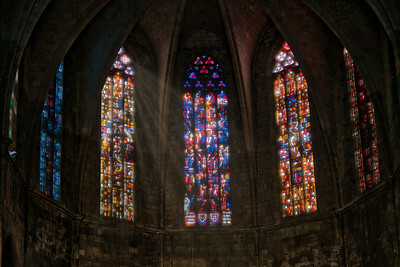 Nevertheless the real attraction was the light coming through the large multicolored windows. On a side note, I just finished the latest novel by Dan Brown called Origin and most of plot takes place in Barcelona. Having been there several times in the last couple of years the book was especially fun to read. I haven’t been everywhere in Barcelona but the gothic quarter is one of my favorite places. If I’m not mistaken, I think there is something very special about this city. I can’t quite put my finger on it but I am willing to go back and give it another try. This is the Church of the Santissimo Redentore. It’s on the island of Giudecca in the city of Venice. It was built in the 16th Century to commemorate the Black Death. At that time about a third of the population of Venice perished. Nevertheless, the architecture of this white marble cathedral is striking at night and this is a shot I took while passing by from a water taxi. When I think of the plague I feel fortunate to live in an age with the advantages of medicine and hygiene. That’s not to say we are completely immune to pandemics, but the chances are much less. If I think about it I feel bad for the reasons this was built, but then that was the whole point. The builders were sending a message through the centuries so that we would remember. I mean no disrespect but that’s the same thing photos do, connect us to an event across time. This photo reminds me of an amazing night in Venice, which in turn reminds me of the plague. So now I have a set of breadcrumbs that lead from one thing to another, bringing to mind different things that are each important to remember. I took this while in a water Taxi on my first night in Venice. Sunsets like this don’t happen every day so I felt fortunate. This is one of those cases where just being there is fifty-percent of photography. I was ready with my camera so I was lucky to get the shot. They say the best camera in the world is the one you have with you. In this case I was touring so I had my Sony. More often however I have only an iPhone. I see sunsets at home all the time and I wish I had the Sony but at least I can pull out an iPhone. It takes nice pictures but not as good as the Sony, at least for now. The way things are going that gap will continue to shrink and maybe cameras will become a thing of the past. Every picture tells a story and as we take more the stories just keep piling up. Then, long afterwards we can go back and re-live the stories by looking at our pictures. The same for video but I prefer still images because I think they go deeper into our thoughts, imagination and memory. Regardless of the camera, it’s good to never be without one, you just never know what you’ll see. 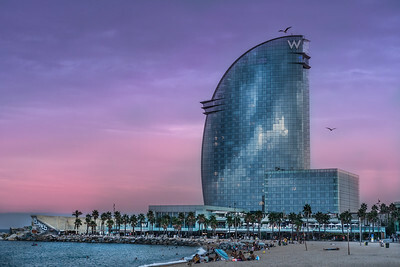 This is an artistic rendering of the Agbar Tower in Barcelona. A few days ago I posted a section of the tower at night. The tower is so fantastic to look at that I couldn’t help but take a bunch of photos. Also, I was staying at the hotel right next door. I worked a long time on this in post-production. First of all it’s a vertorama of three stacked images. I was standing about block away yet it was too big to fit in the frame with my 35mm lens. Later I rendered the sky in Topaz and masked in the tower and the people. That’s a quick description of a long but enjoyable process I used to get to the final image. Speaking of final images, I worked so long on this it feels incomplete. Whenever I perform any kind of detailed work I have a tendency to want to keep fiddling with it. That also applies to other areas, not just photography. 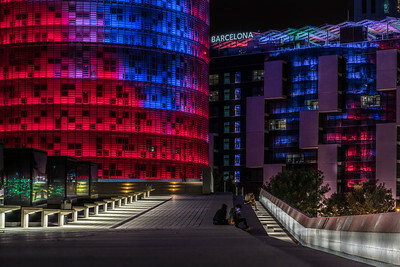 In any case, at night this tower is lit and can be seen from all around Barcelona. Figuring it would be a challenge I wanted to create a daytime impression as well and this is what I ended up with. Here is another scene that I rendered with Topaz Impression. 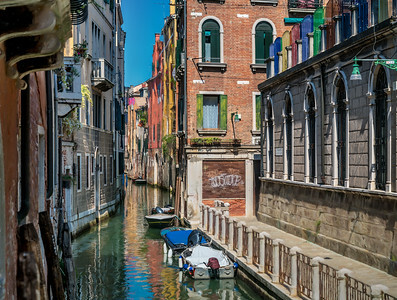 It’s a photo I took of a random canal in Venice and later blended with an impressionistic rendering from Topaz. I’m experimenting with this technique and I am intrigued by the possibilities it presents. 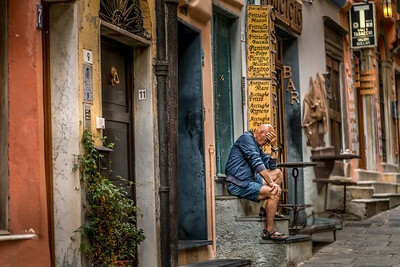 When you visit Venice one of the first things you’ll notice are the artists everywhere. It’s easy to understand because of the abundance of inspiration. If I was a painter I could see myself on a random bridge of a canal painting a similar scene. As a photographer / technologist I use software to get the effect of a painting to create an impression of the place, which is sometimes more satisfying than documentation. The way software and computers are going we will one day simply look through glasses and have any scene rendered the way we want to see it in real-time. It will be a form of advanced augmented reality and it’s probably not too far off. That, and who knows what else. 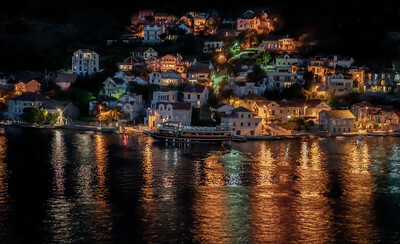 This was the night scene in Lepetane Montenegro as we passed by on a ship. We were leaving the port at Kotor and passing through a narrow channel lined with houses on each side. We could see people sitting on their balconies watching as our ship passed by on a warm summer evening. To me the scene was like a painting; so I decided to process the photo with that idea in mind. I used Topaz Studio to create an impressionistic rendering and then blend it with the original photo. While the image now looks like a painting, in some places it’s more realistic. It plays a little trick so we are not sure which it is, however it’s a little of each. It’s amazing that software can “paint” a scene from a photo. But course its called digital rendering and not painting. Yet the software can be configured to use all manner of brush strokes, paint volume and even mimic styles of the masters. This is a case where computers are approximating art; which for me is amazing. The image represents an impression of a small coastal village at night, which for me is how I remember it. In my mind this type of rendering creates a feeling of the place that is easier to recall than with the unaltered realism of a plain photo. Stay tuned, I’ll be experimenting more with this amazing technique in the coming days and weeks. 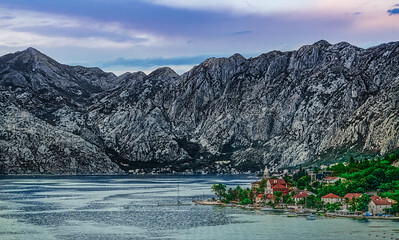 This is a photo of the village of Dobrota in Montenegro that I took from a ship in the Bay of Kotor. We spent an amazing day in Kotor and were leaving when I took this. The geography of the area reminded me of fjords. There are narrow inlets surrounded by towering peaks and the view is amazing. In Kotor we rode in a bus up an impossible single lane road to the top of these mountains. Even though the bus drivers are some of the best in the world half the passengers were praying fervently. It’s said the bus drivers in Montenegro bring more people to religion than the priests. After twenty-nine hairpin turns, I believe that to be true. I also have some images looking down at the water from these peaks. Either way you look at it this is one of the most scenic areas of Europe. 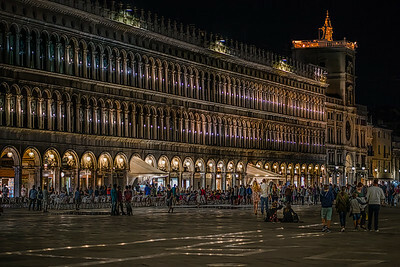 This is another night scene of St Marks Square. There were a lot of people here and I wanted to capture the energy of it. There are so many different perspectives you could take of this place, but this time I chose to include the crowds. The architecture makes the scene but I find it more interesting with people. 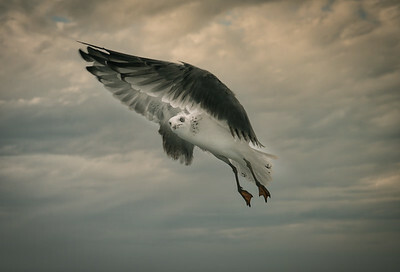 High-resolution photography creates an opportunity to go back and people-watch. Often when I’m reviewing photos I’ll zoom in to observe some detail that was lost on me at the time. When taking photos I’m composing so even though I’m recording a scene I’ll miss a lot of details. Through the image I can go back and revisit much more of what was going on at the time. In that respect photography is a little like time travel; it takes us back to an event in a vivid way. Reviewing photos is not for our memory, but it fills in details we may not have been aware of at the time. In the end I’m left with a richer experience altogether. 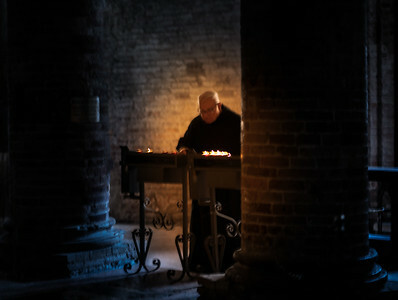 I took this inside the 8th century Le sette Chiese at the center of Bologna. It’s a complex of buildings including a seminary, cathedral and museum. It’s worth a visit if you’re in the area. I will say that Italy has a lot of is Catholic churches and it’s easy to get overwhelmed with so may. Before you know it they all start running together and you can’t remember one form the other. At least that happens with me, so I look for things to take pictures of to remind me of something unique. In this case there were monks walking around attending to duties and I thought that was interesting. I try to be as discrete as possible in situations like this by putting the camera into silent shutter mode. That’s a camera setting and a way to take photos without any shutter noise. More and more cameras have that these days because it’s useful in a lot of settings, not just churches. Think for a moment of a golf swing or a recital and you can imagine how any sound might ruin the moment. Anyway, I’ve even set a button the camera to turn on silent shutter mode so I can quickly and quietly capture moments like this. 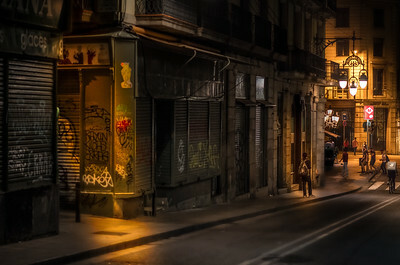 This is a small section of the Agbar Tower that I took one night while in Barcelona. I wasn’t even supposed to be there but the flights got cancelled due to weather back home. The tour company picked up the tab and I was fortunate to have a few extra days. 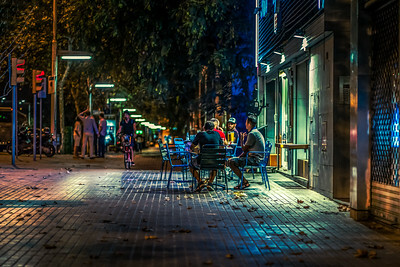 Something I love about Barcelona is that people are out at all hours of the day and night. This was taken after midnight on a Sunday. No matter where I went I found people out walking or just hanging out. 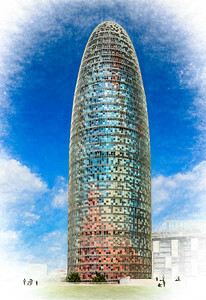 The colorful Agbar Tower is an iconic landmark and we stayed next-door at the Diagonal Barcelona. You can see it to the right with the Barcelona sign. It’s a hip hotel with nice spaces to chill like a rooftop pool and bar that provided great views of the city. Being so close to the tower made it easy to get back to the hotel. Whenever I took a taxi back I could just say, take me to the Agbar Tower. I’d definitely stay here again on my next visit, because even with three extra days it’s not nearly enough time to take it all in. Here we are pulling out of port in Barcelona being followed by a flock of gulls. It was amusing because they seemed to know the routine and followed the ship quite a way out. It was an excuse for me to get some funny photos. When it comes to animals I anthropomorphize them; I assign human traits to their expressions and actions. I think we’ve had it wrong all along. Perhaps I see the animals in a different way, like maybe there’s more them. I always try to show animals respect and never assume I know how intelligent they are or what they’re thinking. On the other hand I eat meat, so that’s something to reconcile. That’s my inconsistent sense of things and if you asked me to explain better I probably couldn’t. Nevertheless, I still think our co-inhabitants on this planet deserve more respect than we give them. And for that I am happy to feed the gulls. This was taken from a water taxi as we passed a cruise ship leaving the port of Venice. I’ve been on several cruises and the port of Venice is the most scenic I’ve seen. This was not the ship I was on but if you look close you’ll see all the passengers lined up along the rail. They’re looking out at the city of Venice. I was on an even larger ship that left a few hours later and the scene must have looked similar. There were so many people standing on one side that the hull tilted towards the city. It was the most amazing feeling; the ships are so large it never occurred to me that the weight of the passengers could make it tilt. 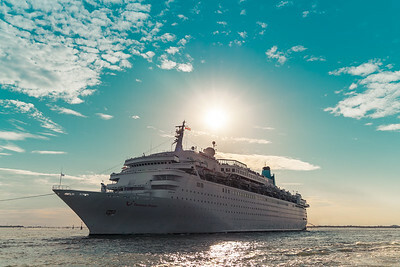 The procedure for docking a cruise ship in Venice involves being towed by two or more tugboats. The tugs are massive machines. There is one that pulls from the bow and one or more that guide the stern. Because they move so slow you have a perfect vantage of the city. I stood on the thirteenth deck and looked down upon the rooftops. It was one of the highlights of the cruise. In any case, this was just a random shot with an interesting perspective. It’s one thing to stand on the top deck and look out, and quite another to see it pass by from the water level. 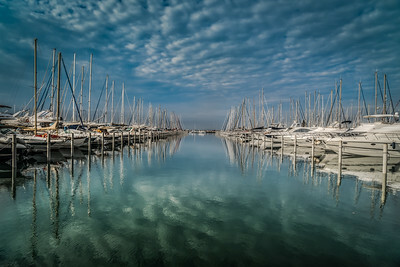 I was La Grande-Motte a couple of years ago walking around with my camera. A friend who was running some errands dropped me off for the morning. It’s a seaside resort town on the Mediterranean and in that respect has a lot of similarities to where I live in Florida. I was here in the off-season so it did not have the normal crowds. I could be wrong but it seems like there are more sailboats in Europe than in the states. I’m no expert but I think we have more powerboats in the US. Nevertheless these long rows of docks are common in southern France. The symmetrical leading lines of the rows reflecting on the water fascinate me. For that matter, leading lines and water always grab my attention. It’s something I’ve taken photos of over and over again. There is a good explanation for it, I’m sure. 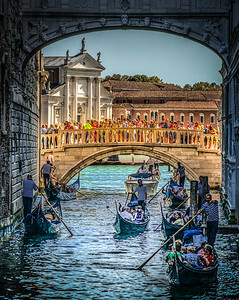 This is the Bridge of Sighs as it frames a crowd of people beyond. In this case I am focused on the crowds rather than attempting to obscure them. It’s a different perspective but something I’ve been exploring lately. Lets just say it’s a slightly different take on travel photography. My idea is to have crowds of people juxtaposed to architecture or in iconic settings. If it’s done right there’s something that makes us want to look closer. Normally crowds are not that interesting but therein lies the challenge. Also I write about it because it helps me make sense of new ideas like this. The more I integrate it the more I can repeat this idea in different settings; it’s a form of study. Writing is an integral part of photography for me. I take a photo, work on it and then write about it. In the end I have a something more than just a photo. All the while I’m learning something new and having a little fun. And as they say, it’s all good. 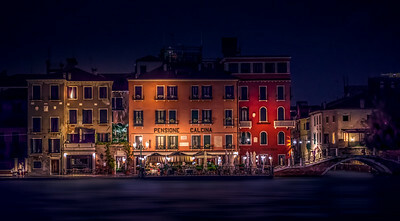 Here is another vision of Venice that I took from a boat. A vision is what best describes this place; it seems not entirely real. When you’re in Venice the real world seems to fade away and become distant. Venice holds its own kind of reality, like the fabled Brigadoon. 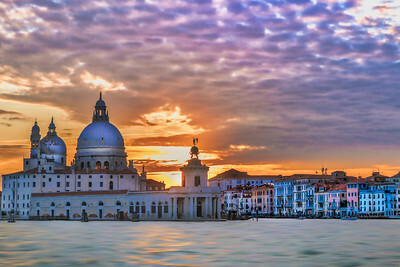 And then the opposite happens, you leave and the magic dissipates and you feel that Venice was like a vision. Anyway, like some other photos I’ve produced, this was taken hand held at night from a boat. I’d normally use a tripod to get a better exposure with a lower ISO, but using a high ISO my camera’s sensor is able to recover most of the details of the night scene. Do you ever notice that when you go to an amazing place you feel like you want to live there? Or maybe you feel like you’ve been there before. The excitement of seeing new places and the feelings it produces are why we travel in the first place. This is travel photography with a twist. It’s from a place that doesn’t seem real until you go there. It seems to have a reality slightly removed from the real world. Maybe I should call it vision photography, …or maybe not. 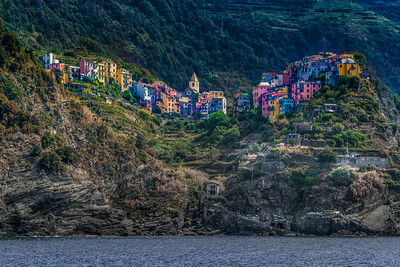 I took this photo of Corniglia from a small boat travelling along the Cinque Terre coast. It was a very hot day so sitting in a boat was a good option. We passed several little villages just like this and I was thinking it would be hard to imagine a more picturesque setting. The villages look remote and isolated but in fact are connected by trains, roads and a hiking path. In one sense it was a shame I only had a day here, but now I know where to come back for a proper visit. When you look closely at these towns on the rugged slopes you realize they’ve taken centuries to build; the locations are most improbable. I believe they were originally properties of barons and such and the inaccessibility was a deterrent to pirates. Now they are communities with traditions, culture and hundreds of years of history. And based on the way they are built, I think they’ll be around for many more centuries. Because I did not set the shutter speed correctly this image came out looking double exposed and blurry, like an impressionistic painting. 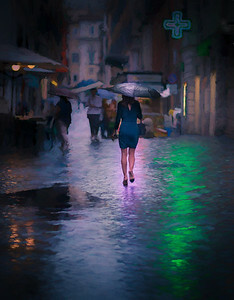 This is not something I intended but looking at it now it feels a little like my memory of that evening in Venice. In my short visit I experienced sights, sounds and feelings. The more I go back to look at the photos the more my memories are formed. But it’s totally subjective and what I remember is unique to me alone. There is much in life I don’t remember because I never took the time to. If we don’t think about something it may not make an impression and is soon forgotten. However when we do, we build memories from our impressions. Memories are like paintings, they are renderings, not true recordings. In the case of art, impressions are more important than fact. 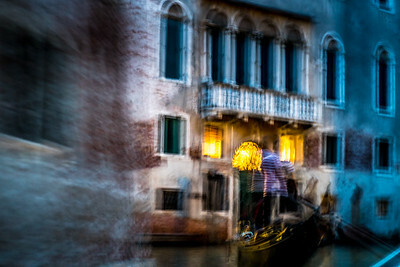 The sounds of the oars in the water, the chatter of the gondoliers, the lights of the overhead windows and the evening shadows across the buildings; all of these combine into an impression that is so perfectly preserved with a simple camera mistake. I’m embarrassed to say I have no idea where in Rome this is, nor the name of it. I ran in here to escape the rain and was astonished by the architecture and frescos, not to mention the silence as compared to the busy street just outside. 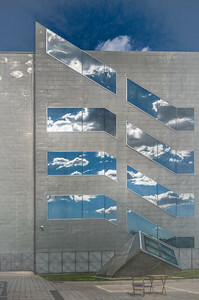 A vertorama is like a panorama, only vertical. I took three images, the first at eye level and the third straight up. When they are stitched together they create a perspective that shows more than you normally see at a glance. It’s a little disorienting but fun to look at just the same. There were no signs warning against photography so I felt free to take my time and compose the image. Some churches will charge a small photo fee that I’m more than happy to pay. 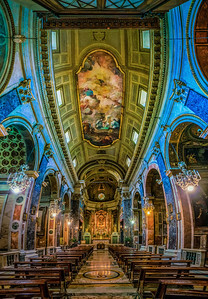 These churches are studies in architecture and art, it seems to me the more they are shared the better. I’d like to think I’m doing my small part to share this amazing cathedral with the rest of the world, completely free of charge. One evening in Barcelona we walked along the beach from one end to the other. At the far end is the Hotel W Barcelona, where we stopped for a drink before heading back. I took this as we walked away just after sunset. The architecture is unique but also bears a vague resemblance to Dubai’s Burj Al Arab, I think that’s why it caught my attention. For miles along the beach are juice bars, ice cream shops, bistros and restaurants. Just a few minutes after taking this we stopped at an open-air bistro on the beach. Sitting next to us was our United Airlines flight crew from the day before. What was surprising was that they even recognized us; nevertheless we struck up a conversation and had a bunch of laughs as we enjoyed a fun evening with our friends. Europeans eat late and so as we walked back the hotel, the restaurants were still packed. It was fun to see and experience all of this and it’s something I could go back and do again in a heartbeat. This is the Church of the Santissimo Redentore. It’s on the island of Giudecca in the city of Venice. It was built in the 16th Century to commemorate the Black Death. At that time about a third of the population of Venice perished. Nevertheless, the architecture of this white marble cathedral is striking at night and this is a shot I took while passing by from a water taxi. When I think of the plague I feel fortunate to live in an age with the advantages of medicine and hygiene. That’s not to say we are completely immune to pandemics, but the chances are much less. If I think about it I feel bad for the reasons this was built, but then that was the whole point. The builders were sending a message through the centuries so that we would remember. I mean no disrespect but that’s the same thing photos do, connect us to an event across time. 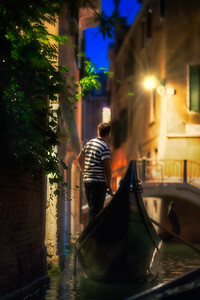 This photo reminds me of an amazing night in Venice, which in turn reminds me of the plague. So now I have a set of breadcrumbs that lead from one thing to another, bringing to mind different things that are each important to remember.